Another summer is almost here and you know what that means; the annual Book Study Blog Party is about to begin! We’re going to change things up a little bit this year. Please read this post closely so you’ll know exactly what to expect from this year’s book study. Instead of reading and discussing just one book, this summer we will focus on a single topic. 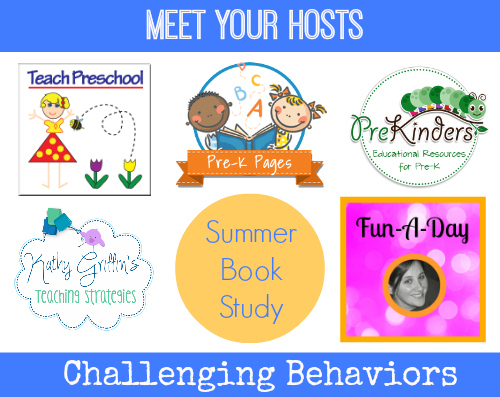 There is no “one size fits all” approach to handling challenging behaviors in the classroom, therefore each of the book study hosts will address a particular behavior in their posts and reference a book. It is my hope that this method will help those of you looking for answers to some of your most burning questions regarding behaviors. If you read a post that really resonates with you and you would like to learn more about that particular strategy then you can get more information from the book referenced in the posts. Our blog party will begin on Monday, June 23, 2014. Be sure to follow all the blogs below so you don’t miss out on any of the fun! What Book Will You Be Using? Below are just some of the books that will be referenced throughout the book study. Each host will be choosing his or her own books on which to base their posts. I will add to this list as the book study commences. How Do I Join the Book Study? 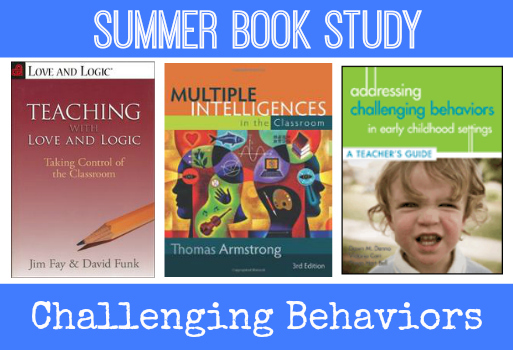 Where Can I Find the Previous Summer Book Studies? Stay tuned for a summer of learning and fun! I am so very excited about this book study. I was referred to the site by my awesome mentor. I had a very challenging year and am looking for new tools and techniques for the upcoming school year. Thank you in advance! We had a play date with our incoming class for the fall and I can see one definite behavior problem. I am looking forward to getting ideas this summer so I can have some tricks in my back pocket when the school year starts. I work in a preschool setting that incorporates students with identified delays and those who are typically developing. We are the only Early Chidhood Center in a large suburban district in the United States and are always looking for positive ways to manage behavioral concerns in all classrooms. Where are the posts going to appear for sessions? I work with Head Start, Preschool Special Ed, Early Childhood Ed (state- or tuition-funded) classrooms and Early Head Start Home Visiting. Looking forward to this study. 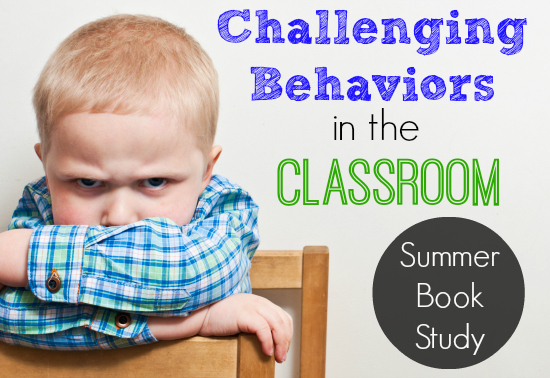 Looking forward to the conversation with other professionals about challenging behaviors. I teach preschool in a public school. I have taught for 20 yrs and still sometimes stuggle with inappropriate behavior. 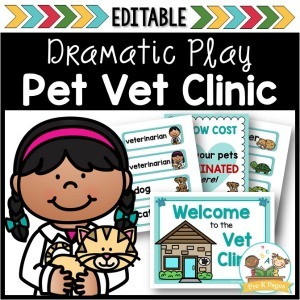 I usually use a behavior modification token/stickers/treasure box program that works most of the time. This past year I had a very bright child that NOTHING worked on! I tried EVERYTHING that I knew how to do-lots of praise, looking for triggers, special attention, ways she liked to help or be a leader, or be rewarded such as drawing time, time out, etc. She finally was moved to another room where her behavior got much worse! They wouldn’t do a child study because her grades were great! I welcome suggestions for future students! Entering my 2nd Year. I just want to be a better teacher. Hi! I am a pre-K teacher with at risk childresn in the East Aurora School District. I am looking forward to particpating and receiving tips on problems I have tried to tackle in my first year in this district. The children have presented challenges in all areas. Thanks fro setting this study blog upVanessa! Hi, I too am looking forward to the insight and sharing of knowledge with this book study. I work with infants and toddlers at risk and those with diagnosed delays. I am part of a special education early childhood program. I have to admit over the last few years the kids are changing and getting more difficult to work with! I am excited to implement new strategies in my classroom! 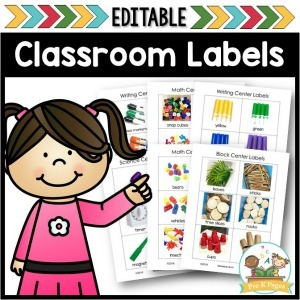 I am new to prek. Not sure I understand how to discipline in prek setting. Also.. over half the class does not understand English and will not listen to teachers. So I am hoping to get some more information. Hi Deneen, Thank you for joining the book study! When working with Second Language Learners it’s important to incorporate lots of visuals (images, pictures) to give your words meaning. Also using expression and body language will help. Children who are learning English are listening, they just don’t understand what is being said. These children need more time and patience when it comes to listening and paying attention. These are the children who will benefit most from hands-on activities, movement and music because they are fun and inviting and do not rely on mastery of the language to be successful. 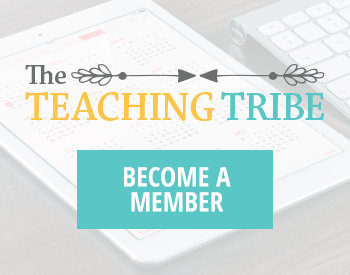 I teach preschool and previously worked in a multiple intense needs class. I thought working in a gen. ed class there would be less behaviors, but I was wrong. I went to the library and didn’t find a single book on the list, so I am posting blindly. The article on Multiple Intelligences sounds good. Does anyone have tips for how to identify them QUICKLY? I seem to take a long time to get to know my students. Hi Cathy, You should be able to put in a request at your local library and they can borrow them from another library and have them delivered to your local library- this is often called inter-library loan. As for identifying learning styles quickly- it does take time and patience. However, we know that most young children are going to relate to movement, hands-on tactile learning, and music. Therefore focusing on hands-on activities, as well as activities that involve movement and music are going to be most successful right from the get go. I start there and then get to know each child individually. Hope that helps! That does help, thanks. I tend to think I’m not fast enough or good enough. I already do use hands on and physical activities and lots of music. I’m probably doing most things right and I’m just too hard on myself. Of course, I always have some behavioral issues, as do all teachers so I’m looking forward to learning more behavioral strategies! I read “Addressing Challenging Behaviors” this weekend, and found a topic that always a tricks me as important and that is “waiting time”… Time children wait during transitions such as hand washing and coats on…this is a huge problem when children with bevy oral issues are involved. I’m still not finding any actual solutions though. Would love to hear anyone’s thoughts or ideas. Personally, during wait times I have always used fingerplays with great success. If you have to be quiet in the hallways we would use our “whisper voices” to do the fingerplays. If you have the children’s hands and lips moving as they participate in the fingerplay and their eyes are on you as you do the motions and sing the song they are much less likely to misbehave. Thanks, Terry, for bringing this to my attention. I have often played the “quiet game” while standing in line. We pick a “bad guy” from some cartoon or movie, and after I count to 3 they have to stay quiet or they are whoever the bad guy is. I tell them I’m going to trick them by asking questions (not yes or no questions) to get them to respond. When they respond by accident, I make a big joke out of it so they don’t feel bad. I have done this in 2nd gd and pre-k. They ask to play it! I have also done fingerplays as Vanessa suggested. I sometimes make movements with my hands and they have to copy them, without saying anything. They like that too. What activities does the book suggest? The book uses singing and finger plays as you suggest and the thing I found most useful would be smaller groups and a learning moment in between. 2 students for getting their coats and making a helping game to quicken the line up to go outside. Also a sign in when they line up and a checkout when they are done. Good ideas. Thanks for sharing them. My book: Diffusing Disruptive Behavior in the Classroom by G. Colvin. This book is VERY helpful! The basic premise in a nutshell is 2-fold. 1) generally students act out either to get attention ( if they’re sent to the office the got what they wanted) or avoid something (maybe the task is too hard) and 2) teachers react, students react to teacher and a behavioral chain is created where student’s behavior escalates. 2 concerns: A) How do I get my assistant to handle behaviors the same way? You would think they’d take their cue from the teacher, but not always! B) My IA stays at resource w/ students. I don’t. That is my valuable planning time. I can’t make resource teachers use the same behavioral method that I do. I have been a preschool teacher for 25 years. 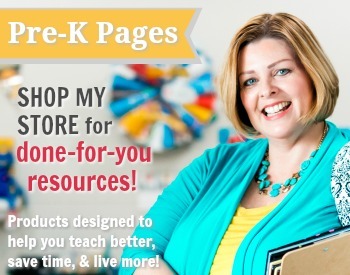 I am loving this book study and the websites at each location. I am enjoying the multiple intellegence info and the info from each person that has commented and the responses. Thanks for giving of your time. I have been teaching preschool since 1984. Behaviors have gotten more challenging. Since the book study is over, I wanted to know how we received a printable certificate for following the weekly blogs? Thank you for this wonderful learning opportunity and I look forward to learn more in the future by viewing your webpage! The certificate was posted in the final post of the book study at the following link: https://www.pre-kpages.com/rewards-in-the-classroom/ You can visit the link to find your copy to download. Have a great year! I learned a great deal this summer and will be taking back to my center a great deal of information to share! Thank you! I have enjoyed learning all this information. Do you know what bookstores carry these books? I purchased all of my books on Amazon Tammy. Thanks for joining us, I’m so glad you enjoyed the book study! I like the new format for the book study! 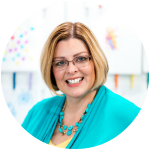 I have found that training teachers how to work with parents an important part of this process in addition to learning skills to work with the children who are experiencing challenges with social and emotional development.